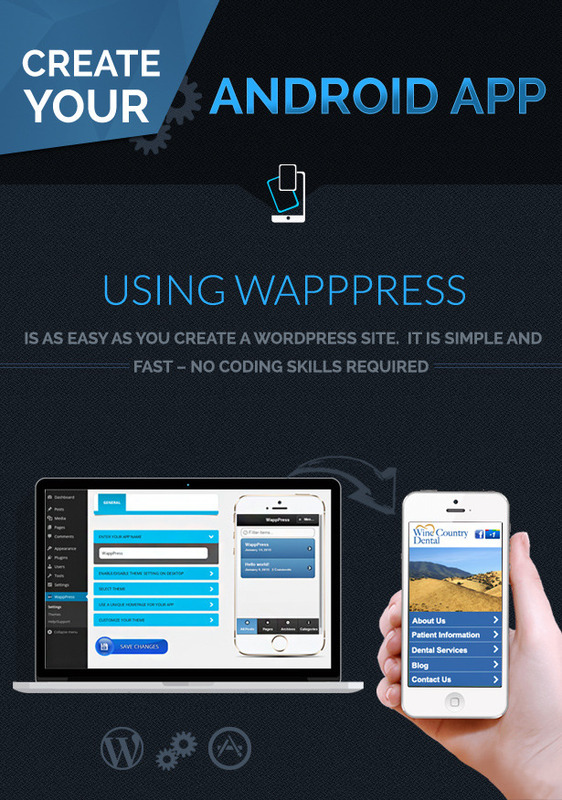 WappPress – Most Easy to use and Simple Wordpress Plugin to create an Android Mobile App for Wordpress site in real time. It is packed with highly useful features like Push Notifications, Admob , custom launcher icon, custom splash screen, instant App build in real time. Its an excellent tool to convert Wordpress to mobile app instantly. WappPress is the best product available in the market at such an affordable cost. Thousands of people have used our product and are fully satisfied and happy with WappPress. It is very simple and easy to use, you do not need any coding skills to use it. 1. Using Wapppress, you can create an Android App all by yourself without the need of any coding skills. 2. Its very simple and easy to use. 3. Android App is generated instantly on click of a button. 4. You can customize your app by using our plugin features. 5. You can select a different theme for your App. 6. You can select a different home page for your App. 7. You can choose and customize launcher icon. 8. You can choose and customize splash screen. 9. You can add custom message on splash screen. 10. No Coding skills are required, any non technical person can create an App. 11. The App that is generated can be published to Google Play Stores. 12. Generate App and reach out to more users. If you have any questions , please do not hesitate to ask us , we are here for your assistance. We shall provide excellent support for any queries / issues in quick time. We shall provide support by email. We shall respond back in maximum 24 hours. If you have any queries, please do let us know we are here to assist you completely.